If you haven't read the book (which you should!) here's a (very) brief summary (I don't wanna spoil it for you!) Harry Potter who just last year found out he was a wizard, returns to Hogwarts for his second year. But there seems to be something different about the school this year, mysterious messages on the walls claim that the legendary Chamber of Secrets has been opened and that the Heir of Slytherin has returned. Slowly students are being petrified. Throughout the year, Harry, Rob, and Hermione investigate the attacks. This was such a heart-pounding moment of the book and movie! In this scene, Harry and Ron are unable to get into platform 9 3/4 and miss the Hogwarts express. 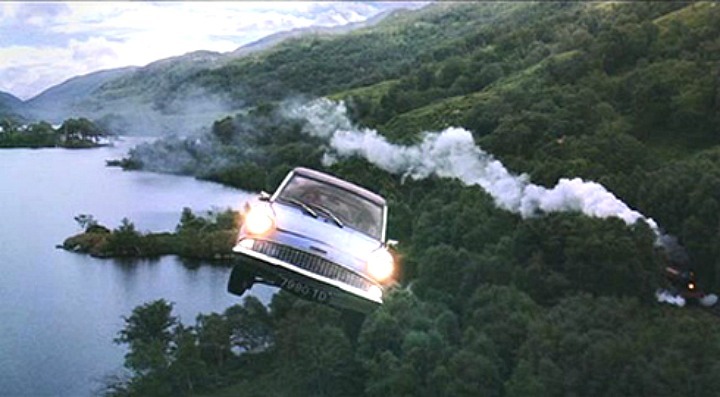 Out of desperation, they take Ron's father's car to the castle instead. In this outfit, I started with a blue dress with buttons that resembled the headlights of the car. I added a trunk-like bag, and a cage and owl accessories which resemble Harry's trunk and Hedwig. Finally, I added a few white pieces and brown flats. Another magical moment in the book is when Harry finds Tom Morvolo Riddle's diary. He realizes that when he writes in it, it writes back. 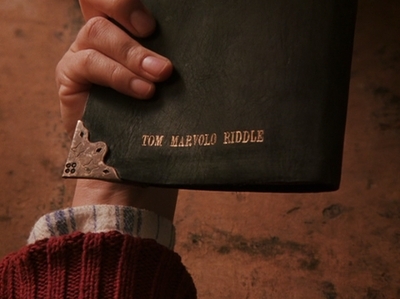 The diary shows him the events of 50 years ago, when the Chamber of Secrets is first opened. The book is jet back with golden accents. I found a clutch that resembled the color and corner of the book. Then, I found a stunning black and gold dress and paired it off with a leather accented coat. Then I added a few gold and black accessories, chunky heels, and a book ring. Finally, a pair of deathly hollows earrings! Fawkes is one of my favorite animals in the series. 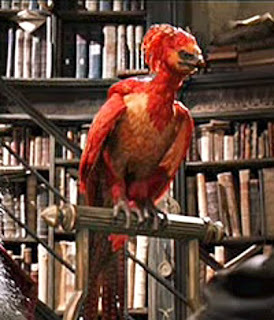 A magical, majestic phoenix who is Dumbledore's companion. Harry first sees Fawkes in the headmaster's office. The Phoenix later helps him when he is in the chamber of secrets, saving Harry's life. I'm exceptionally fond of him and the deep message that Phoenixes represent. At old age, they burst into flames and then rise again from their ashes. These birds have red and gold feathers so I started with a firey-red, ruffled dress which resembled the bird's color and feathers. Next I added a bird brooch, and golden feather accessories. I then paired the ensemble with a pair of golden heels and a sparkly clutch. To finish off the outfit, some bright red lipstick! 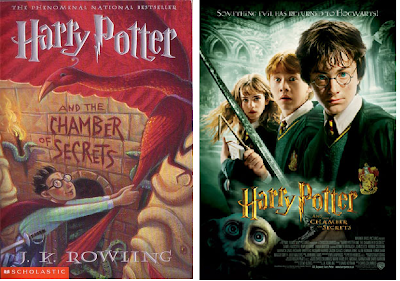 Nearing the end of this book/movie, Harry and Ron find themselves in the Chamber of Secrets to save one of their classmates. The chamber is damp and dark, with huge statues of snakes on either side of a long corridor. I exemplified the eerie, dark green with a dress of the same, shiny color. I then added shoes and a clutch which were both deep green and scaly. Finally, I added a few gold snake accessories with green gems to represent the hidden basilisk in the chamber. When Harry enters the chamber, he comes face-to-face with the basilisk, and enormous snake which can kill with a single glance. To fight the basilisk, Harry uses the sword of Godric Griffindor. For this outfit, I started with a snake-skin top over a dark pair of skinny jeans. Next, I added snake accessories to represent the basilisk and a sword necklace to represent the sword of Griffindor. Finally I added a pair of cream colored flats and a backpack. What an awesome post! I've been re-watching the HP movies over the Christmas movies. So sad it's ended! There is nothing to look forward to in the cinemas now, ha! It's really ingenious the way the book series worked out for those who read them growing up--we all grew alongside Harry, and thus adored him all the more. Great illustrations for each scene/theme from the movies. This is a genius idea for a post. I love this. All the looks are perfect and fit in with the theme so well. It was really fun to see a post like this. Wishing you all the best for the new year. Haha this is such a cool post idea! And even a great fashion idea in general. I love the first inspiration board! Wowza, I LOVE this post. I'm also a huge HP fan (who isn't!?) and the looks you've created are awesome. My faves being Fawkes the Phoenix and The Chamber of Secrets! I've been meaning to go to the Harry Potter studio for months now, I'm definitely going to make it happen STAT. I'm a huge HP fan, so i totally loved this post!!! The looks you created are amazing and so in line with the movies! 1st one is my fav! Nice article I love your selection! and I wish you a happy new year! What an incredible post! I love every one of these looks, especially the Flying Car one. This makes me want to have a Harry Potter marathon. If any of you are looking for some ways to save money in 2014, check out Dorco. We're a shaving company providing quality razors for up to 70% less than leading brands. But don't take our word for it. Read what others think of the quality of our products and see our prices for yourself at DorcoUSA.com. Thanks again for sharing this amazing post! Fabulous post ! All those outfits are perfect (and I love Harry Potter ). First style is my fav ! wow!! great fashion inspiration!!!! the red & gold set and black & gold set would be my have!!! so fabulous! Happy New Year lovely! I am yet to read these books but seen all the movies. Loving this edit you've created! Oh my goodness! I absolutely love this post :) You did a wonderful job with these outfits, I see the theme in each of them, but they do not look whatsoever costume-ish - just perfect! These outfits are absolutely perfect! these are such beautiful outfits!! I would wear all of them. I actually really liked the fashion from the last harry potter movie, all the fluffy knits that Hermione wears. I cannot tell you how much I geeked out when I saw the title of this post. And then I geeked out some more when I saw the outfits. You did a beautiful job, dearie; I could feel the scene in each thing you chose. Wonderful!